One of the first Action Figures I got when I was younger. I bought him with Bebop. Of course you have to get these guys in a pair that's were you can re-create the best fights scenes. Brings back memories taking my old action figures out of storage. 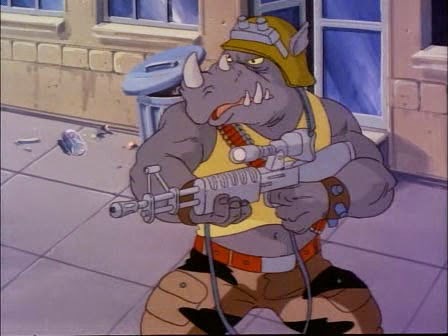 Rocksteady was originally a Caucasian-American human member of a gang of criminals who operated under the Foot, when one of their thefts was interrupted by an attack by the Teenage Mutant Ninja Turtles. Rocksteady was originally a short and stocky blond Caucasian man (who sported army camouflage pants that would be replaced with simple beige cargo pants later while also occasionally sporting an army helmet on his head in his mutated form). 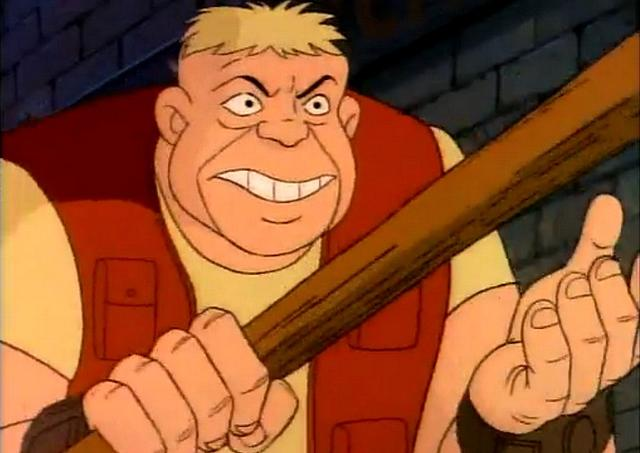 With the other members of his gang, he was sent out to stop a Channel 6 reporter named April O'Neil from doing a report about crime in the city. April ran down into the sewers while being chased by the street gang and met the Teenage Mutant Ninja Turtles, who then defeated the gang in a fight. Rocksteady's field glasses survey the area for anything that looks like a Turtle. (He's mistakingly blasted six soccer balls). This G.I. rockhead blatantly displays his victory kills with the turtle scalps he wears around his belt. 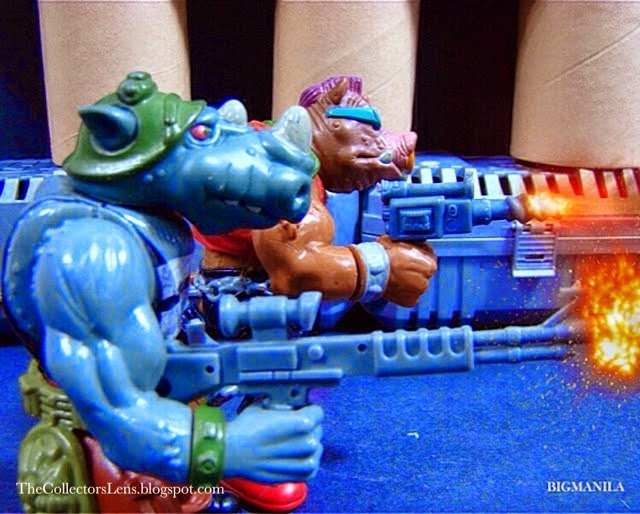 Rocksteady and Bebop were designed by Peter Laird while they were negotiating the action figure deal with Playmates, as they wanted more characters to release. They were added into the show and given names, personalities and an origin story by writer David Wise, based on instructions by Fred Wolf to "put more mutants in the series". 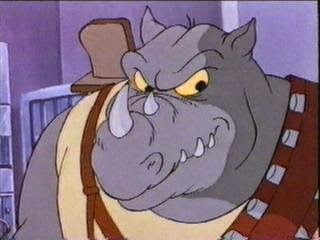 Rocksteady was a street thug who is mutated into an anthropomorphic rhinoceros. 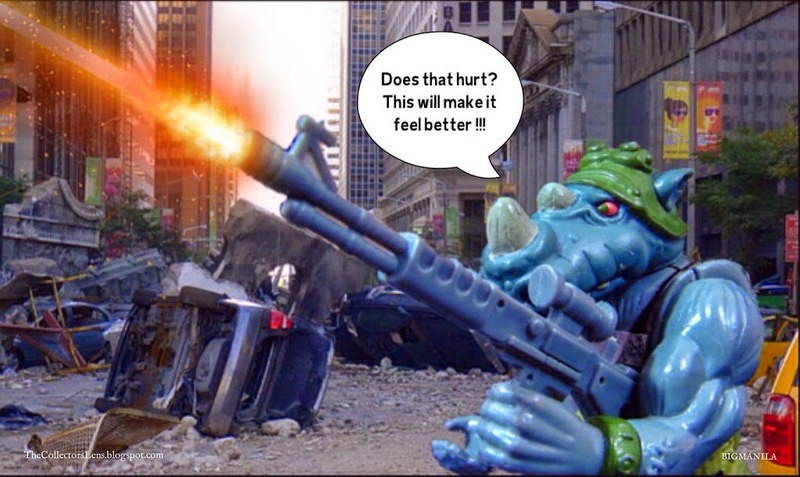 He is loyal to Shredder and is usually paired with his friend Bebop.